Subjective: A 26 year old female presents with constant excruciating migraine headaches and neck pain for approximately 1.5 months. She also experiences swelling at the base of her skull and her temples. She has been to the emergency room on several occasions; however, no conclusive diagnosis was given. Medical treatment has included sub-occipital injections and prescriptive medications with only temporary results. Past History: Severe auto accident with head and neck trauma in 1994 and 1998. Treatment: Conservative chiropractic spinal adjustments combined with ultrasound and electrical muscle stimulation. Results: Migraine headache resolved after second treatment. (No headaches again until @ 1month later). Why were her treatments successful? Simply stated, spinal misalignments cause pressure on the nerves (pinched nerve) that leads to pain and problems. 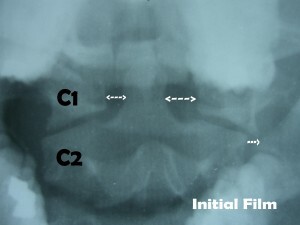 Notice the obvious misalignment of the first vertebra on the second vertebrae of the neck (C1 and C2) in the initial x-ray. C1 has shifted significantly to the right. 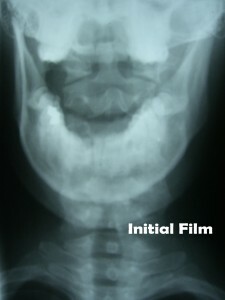 This patient required additional x-rays 2 days after her initial x-rays and treatment. 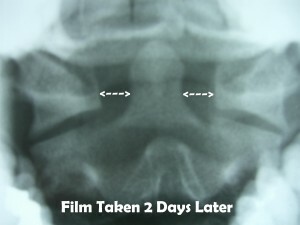 (These x-rays were to investigate a different condition.) Subsequently, they revealed a dramatic change in the alignment of C1 on C2, thus relieving stress on the nerves and joints in the neck region. BETTER ALIGNMENT = LESS STRESS ON NERVES + LESS PAIN. Ultimately, you feel better and your body functions better. Please note that we do not routinely take follow-up x-rays to illustrate changes in spinal alignment, but we do routinely see obvious changes in our patient’s symptoms after aligning their spines! Keep Your Spine In Line So You Can Feel Fine!